Relatively few studies of cranial endocasts document intraspecific variation. Here, discrete morphological and morphometric variation from a sample of more than 150 natural cranial endocasts from a single Eocene locality, Reeves Bonebed (hereafter ‘RBB’) from West Texas are documented. 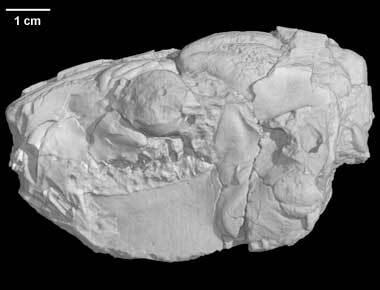 The first description of a digital endocast of an oreodont, Bathygenys reevesi (see Additional Imagery), is given to provide comparative data for other oreodont endocasts. The RBB endocasts were originally assigned to B. reevesi, but virtually none has diagnostic craniodental material still attached, and isolated endocasts of other cetartiodactyl species are known from this locality. Consequently, an attempt was made to identify apomorphies on the RBB sample to diagnose specimens to the lowest possible taxonomic level. The RBB endocasts were diagnosed as oreodonts based on the presence of large, rounded casts of the tuberculum olfactorium, but no specimen can be diagnosed to a particular species. The range for most linear measurements for the RBB sample overlapped with measures from multiple species of oreodonts from RBB. A coefficient of variation analysis of linear measurements suggests that the RBB sample represents more than one species. Therefore, endocasts from RBB that lack associated craniodental material cannot be definitively assigned to a species, and the original assumption that all are B. reevesi is not supported. This illustrates the necessity of applying apomorphy-based identifications for isolated specimens, including endocasts. In addition, this study reveals some gaps in data from cetartiodactyl brains, which need to be filled for future studies on brain evolution in this clade. This specimen, the holotype, was collected from the early Chadronian Chambers Tuff Formation, Reeves Bone Bed, Presidio Co., Texas. It was made available to the University of Texas High-Resolution X-ray CT Facility for scanning by Dr. Ted Macrini of St. Mary's University. Funding for scanning was provided by a University of Texas Geology Foundation grant for analytical fees to Eric Ekdale. The specimen was scanned by Matthew Colbert on 13 June 2006 along the coronal axis for 642 slices. Each 1024x1024 pixel slice is 0.1413 mm thick, with an interslice spacing of 0.1413 mm and a field of reconstruction of 64 mm. Bell, C. J., and J. Gauthier. 2002. North American Quaternary Squamata: reevaluation of the stability hypothesis. Journal of Vertebrate Paleontology 22(3, Supplement):35A. Bever, G. S. 2005. Variation in the ilium of North American Bufo (Lissamphibia; Anura) and its implications for species-level identification of fragmentary anuran fossils. Journal of Vertebrate Paleontology 25:548–560. Bever, G. S. 2008. Comparative growth in the postnatal skull of the extant North American turtle Pseudemys texana (Testudinoidea: Emydidae). Acta Zoologica (Stockholm) 89:107–131. Bever, G. S. 2009. The postnatal skull of the extant North American turtle Pseudemys texana (Cryptodira: Emydidae), with comments on the study of discrete intraspecific variation. Journal of Morphology 270:97–128. Bever, G. S., T. E. Macrini, and C. N. Jass. 2008. A natural endocranial cast of a fossil proboscidean with comments on the evolution of elephant neuroanatomy and the scientific value of “no data” specimens; pp. 11–22 in G. H. Farley and J. R. Choate (eds. ), Unlocking the Unknown: Papers Honoring Dr. Richard J. Zakrzewski. Fort Hays Studies Special Issue 2. Bever, G. S., T. Rowe, E. G. Ekdale, T. E. Macrini, M. W. Colbert, and A. M. Balanoff. 2005. Comment on “Independent origins of middle ear bones in monotremes and therians” (I). Science 309:1492a. Black, D. 1915. A study of the endocranial casts of Ocapia, Giraffa and Samotherium, with special reference to the convolutional pattern in the family of Giraffidae. Journal of Comparative Neurology 25:329–360. Black, D. 1920. Studies on endocranial anatomy. II. On the endocranial anatomy of Oreodon (Merycoidodon). Journal of Comparative Neurology 32:271–327. Bruce, A. T. 1883. Observations upon the brain casts of Tertiary mammals. Contributions from the E. M. Museum of Geology and Archaeology of Princeton College 3:36–45. Butler, A. B., and W. Hodos. 1996. Comparative Vertebrate Neuroanatomy: Evolution and Adaptation. Wiley-Liss, New York, New York, 514 pp. Carrasco, M. A. 1998. Variation and its implications in a population of Cupidinimus (Heteromyidae) from Hepburn’s Mesa, Montana. Journal of Vertebrate Paleontology 18:391–402. Clark, W. E. Le G. 1939. The brain of the okapi. Proceedings of the Zoological Society of London 109:153–159. Colbert, M. W. 2006. Variation and species recognition in Eocene tapirs from Southern California. Journal of Vertebrate Paleontology 26:712–719. Colbert, M. W., R. Racicot, and T. Rowe. 2005. Anatomy of the cranial endocast of the bottlenose dolphin Tursiops truncatus, based on HRXCT. Journal of Mammalian Evolution 12:195–207. Czyzewska, T. 1982. Natural endocranial casts of the Cervidae from Weze I near Dzialoszyn (Poland). Acta Zoologica Cracoviensia 26:229–240. Dechaseaux, C. 1969. Moulages endocraniens d’artiodactyles primitifs. Essai sur l’histoire du ne´opallium. Annales de Pale´ontologie Verte´ - bre´ s 55:195–248. Douglass, E. 1902. Fossil Mammalia of the White River beds of Montana. Transactions of the American Philosophical Society 20:237–279. Edinger, T. 1948. Evolution of the horse brain. Geological Society of America Memoir 25:1–177. Edinger, T. 1975. Paleoneurology 1804–1966. An annotated bibliography. Advances in Anatomy, Embryology and Cell Biology (Ergebnisse der Anatomie und Entwicklungsgeschichte) 49:1–258. Franzosa, J. W., and T. Rowe. 2005. Cranial endocast of the Cretaceous theropod dinosaur Acrocanthosaurus atokensis. Journal of Vertebrate Paleontology 25:859–864. Friant, M. 1948. Interpre´tation du cerveau de l’Oreodon. Comptes Rendus de L’acade´mie des Sciences 227:780–781. Geisler, J. H., and M. D. Uhen. 2003. Morphological support for a close relationship between hippos and whales. Journal of Vertebrate Paleontology 23:991–996. Geisler, J. H., J. M. Theodor, M. D. Uhen, and S. E. Foss. 2007. Phylogenetic relationships of cetaceans to terrestrial artiodactyls; pp. 19–31 in D. R. Prothero and S. E. Foss (eds. ), The Evolution of Artiodactyls. Johns Hopkins University Press, Baltimore, Maryland. Getty, R. 1975. Sisson and Grossman’s The Anatomy of the Domestic Animals. Volumes 1 and 2. W. B. Saunders Co., Philadelphia, Pennsylvania, 2095 pp. Gihr, M., and G. Pilleri. 1969. On the anatomy and biometry of Stenella styx Gray and Delphinus delphis L. (Cetacea, Delphinidae) of the western Mediterranean. Investigations on Cetacea 1:15–65. Gruenberger, H. B. 1970. On the cerebral anatomy of the Amazon dolphin Inia geoffrensis. Investigations on Cetacea 2:129–144. Harper, J. W., and J. D. Maser. 1976. A macroscopic study of the brain of Bison bison bison, the American plains buffalo. Anatomical Record 184:187–202. Hay, O. P. 1902. Bibliography and catalogue of the fossil Vertebrata of North America. United States Geological Survey Bulletin 179:1–868. Jerison, H. J. 1979. The evolution of diversity in brain size; pp. 29–57 in M. E. Hahn, C. Jensen, and B. C. Dudek (eds. ), Development and Evolution of Brain Size: Behavioral Implications. Academic Press, New York, New York. Jerison, H. J. 1991. Fossil brains and the evolution of the neocortex; pp. 5–19 in B. L. Finlay, G. Innocenti, and H. Scheich (eds. ), The Neocortex: Ontogeny and Phylogeny. NATO Advanced Science Institutes Series A: Life Sciences. Vol. 200. Plenum Press, New York, New York. Kanan, C. V. 1973. The external configuration of the cerebral hemispheres of the camel (Camelus dromedarius). Acta Anatomica 85:145–152. Kuhn, H. J., and U. Zeller. 1987. The cavum epiptericum in monotremes and therian mammals; pp. 51–70 in H. J. Kuhn and U. Zeller (eds. ), Morphogenesis of the Mammalian Skull. Verlag Paul Parey, Berlin. Kurochkin, E. N., S. V. Saveliev, A. A. Postnov, E. M. Pervushov, and E. V. Popov. 2006. On the brain of a primitive bird from the Upper Cretaceous of European Russia. Paleontological Journal 40:655–667. Lander, B. 1998. Oreodontoidea; pp. 402–425 in C. M. Janis, K. M. Scott, and L. L. Jacobs (eds. ), Evolution of Tertiary Mammals of North America. Volume 1: Terrestrial Carnivores, Ungulates, and Ungulatelike Mammals. Cambridge University Press, New York, New York. Leidy, J. 1869. The extinct mammalian fauna of Dakota and Nebraska, including an account of some allied forms from other localities, together with a synopsis of the mammalian remains of North America. Journal of the Academy of Natural Sciences, Philadelphia, Series 2(7):1–472. Lewy, Z., A. C. Milner, and C. Patterson. 1992. Remarkably preserved natural endocranial casts of pterosaur and fish from the Late Cretaceous of Israel. Geological Survey of Israel Current Research 7:31–35. Loo, Y. T. 1930. The forebrain of the opossum, Didelphis virginiana. Journal of Comparative Neurology 51:13–64. Macrini, T. E. 2006. The Evolution of Endocranial Space in Mammals and Non-mammalian Cynodonts. Ph.D. dissertation, University of Texas at Austin, 278 pp. Macrini, T. E., and E. G. Ekdale. 2007. Study of a large sample of natural endocranial casts of oreodonts with implications for apomorphy-based diagnosis of isolated endocasts and the study of individual variation. Journal of Vertebrate Paleontology 27(3, Supplement):110A. Macrini, T. E., T. Rowe, and M. Archer. 2006. Description of a cranial endocast from a fossil platypus, Obdurodon dicksoni (Monotremata, Ornithorhynchidae), and the relevance of endocranial characters to monotreme monophyly. Journal of Morphology 267:1000–1015. Macrini, T. E., C. de Muizon, R. L. Cifelli, and T. Rowe. 2007a. Digital cranial endocast of Pucadelphys andinus, a Paleocene metatherian. Journal of Vertebrate Paleontology 27:99–107. Macrini, T. E., G. W. Rougier, and T. Rowe. 2007b. Description of a cranial endocast from the fossil mammal Vincelestes neuquenianus (Theriiformes) and its relevance to the evolution of endocranial characters in therians. Anatomical Record 290:875–892. Macrini, T. E., T. Rowe, and J. L. VandeBerg. 2007c. Cranial endocasts from a growth series of Monodelphis domestica (Didelphidae, Marsupialia): a study of individual and ontogenetic variation. Journal of Morphology 268:844–865. Mihlbachler, M. C., and N. Solounias. 2006. Coevolution of tooth crown height and diet in oreodonts (Merycoidodontidae, Artiodactyla) examined with phylogenetically independent contrasts. Journal of Mammalian Evolution 13:11–36. Montgelard, C., F. M. Catzeflis, and E. Douzery. 1997. Phylogenetic relationships of artiodactyls and cetaceans as deduced from the comparison of cytochrome b and 12S rRNA mitochondrial sequences. Molecular Biology and Evolution 14:550–559. Moodie, R. L. 1916. On the sinus paranasales of two early Tertiary mammals. Journal of Morphology 28:135–144. Moodie, R. L. 1922. On the endocranial anatomy of some Oligocene and Pleistocene mammals. Journal of Comparative Neurology 34:343–379. Nieuwenhuys, R., H. J. Ten Donkelaar, and C. Nicholson. 1998. The Central Nervous System of Vertebrates. Springer Verlag, Berlin, 3 volumes. 2219 pp. Novacek, M. J. 1982. The brain of Leptictis dakotensis, an Oligocene leptictid (Eutheria: Mammalia) from North America. Journal of Paleontology 56:1177–1186. Novacek, M. J. 1986. The skull of leptictid insectivorans and the higherlevel classification of eutherian mammals. Bulletin of the American Museum of Natural History 183:1–112. Novacek, M. J. 1993. Patterns of diversity in the mammalian skull; pp. 438–545 in J. Hanken and B. K. Hull (eds. ), The Skull. Volume 2. Patterns of Structural and Systematic Diversity. University of Chicago Press, Chicago, Illinois. Nowak, R. W. 1999. Walker’s Mammals of the World. Volume 2. Sixth edition. Johns Hopkins University Press Baltimore,Maryland, 1100 pp. O’Leary, M. A., and J. Gatesy. 2008. Impact of increased character sampling on the phylogeny of Cetartiodactyla (Mammalia): combined analysis including fossils. Cladistics 24:397–442. Owen, R. 1868. On the Anatomy of Vertebrates. Volume III. Mammals. Longmans, Green and Co., London, 915 pp. Price, S. A., O. R. P. Bininda-Emonds, and J. L. Gittleman. 2005. A complete phylogeny of the whales, dolphins and even-toed hoofed mammals (Cetartiodactyla). Biological Reviews 80:445–473. Quinn, G. P., and M. J. Keough. 2002. Experimental design and data analysis for biologists. Cambridge University Press, New York, New York, 537 pp. Radinsky, L. 1977. Brains of early carnivores. Paleobiology 3:333–349. Radinsky, L. 1978. Evolution of brain size in carnivores and ungulates. American Naturalist 112:815–831. Rowe, T. 1987. Definition and diagnosis in the phylogenetic system. Systematic Zoology 36:208–211. Rowe, T. 1996. Coevolution of the mammalian middle ear and neocortex. Science 273:651–654. Schultz, C. B., and C. H. Falkenbach. 1968. The phylogeny of the oreodonts. Parts 1 and 2. Bulletin of the American Museum of Natural History 139:1–498. Scott, W. B., and G. L. Jepsen. 1940. The mammalian fauna of the White River Oligocene. Part IV. Artiodactyla. Transactions of the American Philosophical Society 28:363–746. Sigmund, L. 1981. Morphometrische Untersuchungen an Gehirnen derWiederka uer (Ruminantia,Artiodactyla, Mammalia) 1.Makromorphologie des Gehirns der Hirschferkel (Tragulidae). Vestnik Ceskoslovenske Spolecnosti Zoologicke 45:144–156. Sokal, R. R., and F. J. Rohlf. 1998. Biometry. Third edition. W. F. Freeman and Company, New York, New York, 887 pp. Striedter, G. F. 2005. Principles of Brain Evolution. Sinauer Associates, Sunderland, Massachusetts, 436 pp. Thorpe, M. R. 1931. Natural brain casts of merycoidodonts. American Journal of Science 21:13–203. Thorpe, M. R. 1937. The Merycoidodontidae: an extinct group of ruminant mammals. Memoir of the Peabody Museum of Natural History 3(Part 4):1–428. Welker, W. I. 1990. Why does cerebral cortex fissure and fold? A review of determinants of gyri and sulci; pp. 3–136 in E. G. Jones and A. Peters (eds. ), Cerebral Cortex. Volume 8B: Comparative Structure and Evolution of Cerebral Cortex, Part II. Plenum Press, New York, New York. Wiens, J. 1999. Polymorphism in systematics and comparative biology. Annual Review of Ecology and Systematics 30:327–362. Wilson, D. E., and D. M. Reeder (editors). 2005. Mammal Species of the World. Johns Hopkins University Press, Baltimore, Maryland, 2 volumes. 2142 pp. Wilson, J. A. 1971. Early Tertiary vertebrate faunas, Vieja Group, Trans- Pecos, Texas: Agriochoeridae and Merycoidodontidae. Bulletin of the Texas Memorial Museum 18:1–83. Wilson, J. A. 1977. Stratigraphic occurrence and correlation of early Tertiary vertebrate faunas, Trans-Pecos Texas, Part 1: Vieja area. Bulletin of the Texas Memorial Museum 25:1–42. Wilson, J. A. 1986. Stratigraphic occurrence and correlation of early Tertiary vertebrate faunas, Trans-Pecos Texas: Agua Fria-Green Valley areas. Journal of Vertebrate Paleontology 6:350–373. Winkler, D. A. 1989. Reeves Bonebed: mammalian predator-prey interactions in the early Oligocene, Trans-Pecos Texas. Geological Society of America, South-Central Section, Abstracts with Programs 21:44. Click on the thumbnail to the left for a pitch animation (2.6 mb) of the isolated Bathygenys cranial endocast. Click on the thumbnail to the left for a roll animation (3.0 mb) of the isolated Bathygenys cranial endocast. To cite this page: Dr. Ted Macrini, 2009, "Bathygenys reevesi" (On-line), Digital Morphology. Accessed April 25, 2019 at http://digimorph.org/specimens/Bathygenys_reevesi/.